Learn about the differences between the file transfer applications in the Zapya Suite of products and find out which one works best for you. All of our products have the fastest file transfer speeds and support cross-platform sharing. As the original and main product in the Zapya Suite, Zapya is an all-inclusive application. Besides the main transfer functions, Zapya houses an array of features. From video discovery to finding new friends to controlling the mouse on your PC, Zapya has it all. Zapya PC works on both PC and Windows Phones. You can share internet with other devices when they are connected to your device. It also makes it easier to share large number of files by supporting the transfer of entire folders. Unlike the other applications in the Zapya Suite, Zapya Webshare only needs to be downloaded onto one of the devices. The other device can access the contents of the device that has WebShare through the web browser. It is the perfect solution for backing up and managing your phone contents on another device. Zapya MiniShare was specifically designed for phones that have limited storage space. The app prides itself on being small and supporting ultra-fast transfer speeds. 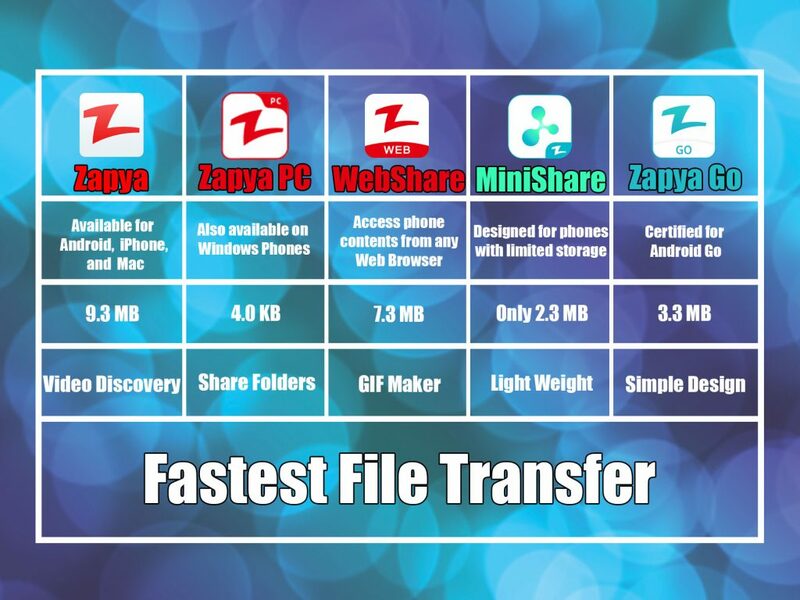 It is compatible with the other applications in the Zapya Suite so that you can easily transfer files to others. Certified by Google for Android Go, Zapya Go is the other lightweight champion of the Zapya Suite. It does not run as a background application so that it consumes less of your phone’s memory and battery. Along with the main file transfer features, there are also online games available so that you can play awhile on the go.